Swift's standard chain is an exceptional value chain with an equal, and in some cases higher, tensile strength than some of the leading brands. 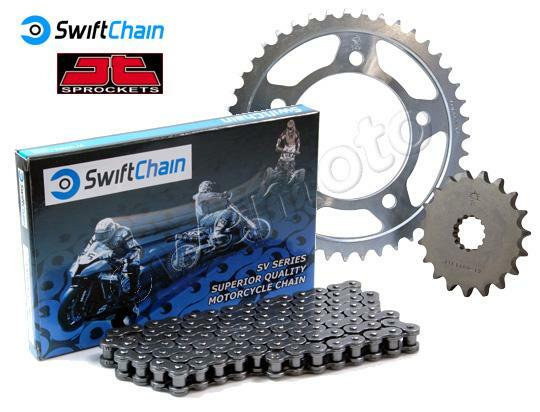 Manufactured to exacting standards in Taiwan, Swift Chain is made from specially heat-treated steel for durability. 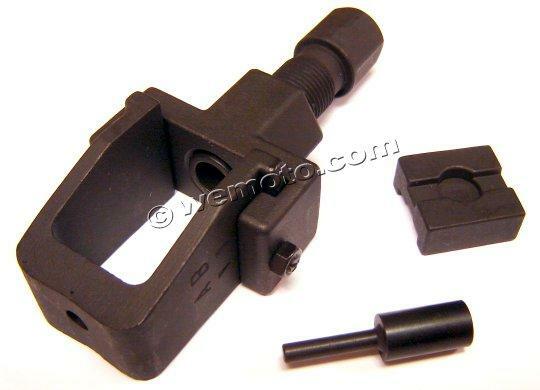 One loose-fit split link is supplied with the chain. JT is the leading manufacturer of aftermarket motorcycle sprockets, with the largest and most advanced factory in the world. JT front sprockets are made with SCM415 chromoly steel, which is fully heat treated for great wear resistance. JT's steel rear sprockets are made with ultra-durable high carbon C49 steel This is a higher carbon steel than the typical C45 steel used by other manufacturers, and so is harder and stronger than any other sprocket on the market. Both front and rear sprockets will be supplied with the standard number of teeth for the motorcycle. Sprockets that have more or less teeth than standard will need to be purchased separately. 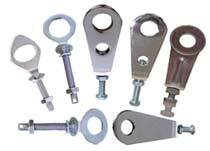 Where available we will list up to 3 teeth larger or smaller to the motorcycle under "Transmission - Sprockets"
If you need fewer or more links in your chain, please call us.